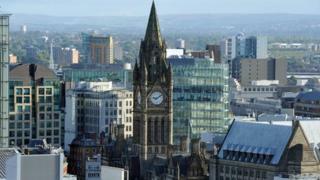 How is Manchester coping with austerity and cuts? The psychological impact of austerity Britain is probably doing as much damage to the economy as the real effect of government spending cuts, according to a survey of business experts, retailers and local government officials in Greater Manchester. How has the Greater Manchester area been coping with government spending cuts and to what extent has the private sector filled the gap? Those are the questions that experts from the Manchester Business School, part of the University of Manchester have been setting out to answer, in a survey for the BBC Radio 4's PM programme. Their conclusion is that by 2015 spending cuts will have taken about £10bn out of the economy of Greater Manchester, with the loss only partially offset by weak growth in the private sector. The regional economy lost 34,000 jobs and £1.5bn from the 2008 recession, even before the spending cuts began. Another 15,000 public sector jobs in Greater Manchester have since been lost or are under threat. There has been an 80% reduction in regional economic aid. Even companies which have grown strongly through the recession are concerned about the fragile level of public confidence. "Whether or not consumers are affected personally by the cuts, I think this whole mood of austerity, the psychological effect of everything they are hearing in the media, is actually making them feel that they shouldn't be spending," said Angela Spindler, chief executive of The Original Factory Shop. The spluttering economy has actually been good for her company, a national chain of outlet stores selling cut-price goods. It has grown from 90 stores to 174 in the past two years and is continuing to expand. "The combination of two things - the real impact on people's disposable income, and the concern about the future - is having a huge impact on people's attitude to shopping," she explained. The company has recently repeated some market research, first done two years ago, and asked customers whether their buying decisions were based on what they want or what they need. The numbers of customers saying they were only buying things they need had grown from 35% to over 50%. "People are much more cautious and much more need, rather than want-driven, and I think that will continue for quite some time," she added. Her view is shared by Prof Colin Talbot from the Manchester Business School, who wrote a report on the survey for the BBC. "I can't remember a period when a British chancellor has talked down the economy for such a long period as now. "As long as those messages keep coming out, my impression is that this is having at least as much impact as the actual cuts. It is making people fearful of their future, and their job security." Sir Richard Leese, the Labour leader of Manchester City Council, told the BBC he was concerned about the effect of the growing financial strain on people's lives. He said mental health services across the city were starting to see an increase in the numbers of people suffering from mild depression, up by about 35% over the past three years. "How are they going to pay their mortgage? How are they going to feed their families?" he said, voicing common concerns. "It's anxiety about whether they can keep their job or how they will pay their bills. These things have a real impact on people and we are seeing that impact now." However Matthew Colledge, the Conservative leader of neighbouring Trafford Borough Council in Greater Manchester, said the spending cuts were creating business opportunities for small companies looking to take on public services previously delivered by the public sector. "I think fundamentally we are in a period of acute transition," he said. "You can almost feel a slightly wartime spirit coming out where we are going to have to knuckle down and get quite creative and innovative about how we deliver in a new way. "The country has clearly, for many years now, been living beyond itself and so unfortunately it's a very bitter pill that will have to be swallowed." Joanne McCann, a mother of five who lives in east Manchester, said she was cutting back on Christmas presents this year. "This time two years ago we had a surplus in this house and we might have decided to spend that money by going away. Not now. Now it's a minus. The cost of everything is soaring through the roof." Could she see things getting any better? "Not in the foreseeable future. I think we're going to be like this for the next few years. I can't see any way out of it."